In July, the Penn Special Collections Center hosted the Rare Book School course on 15th-Century Books in Print & Manuscript, taught by Paul Needham, Scheide Librarian at Princeton, and Will Noel, Director of the Schoenberg Institute. On the first morning, the students looked at matched pairs of incunables and manuscripts from the Penn collections to consider how manuscript formats shaped expectations for early printed books. 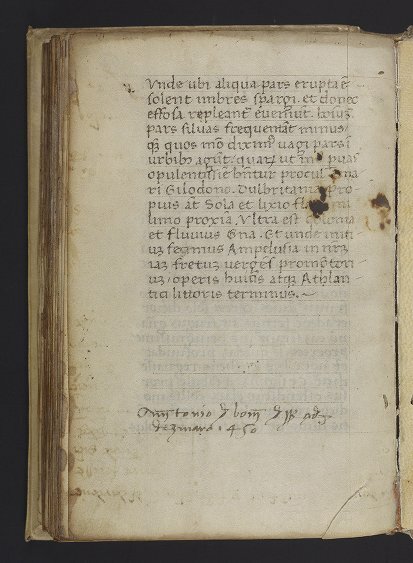 One of the most pleasing pairs was the Schoenberg mid-15th-century manuscript of Pomponius Mela’s 1st-century geographical treatise Cosmographia (LJS 60) and Penn’s copy of the edition of the same text printed in Milan in 1471 by Pamfilo Castaldi (M-447). The two books offer several nice points of comparison: M-447’s leaves of 18.5 x 12.8 cm (a trimmed chancery quarto) are only slightly larger than LJS 60’s parchment leaves of 17 x 11 cm, although the difference would have been greater before the printed book was trimmed and rebound. The printed text on the page is 22 lines in 12.5 x 8.1 cm, written text on the page is 23 lines in 11.9 x 6.7 cm. LJS 60’s humanist bookhand is not so far from M-447’s Roman type. The most striking match, however, was the way in which both these books were annotated, with proper names of places and peoples being pulled from the text and written in the margins. 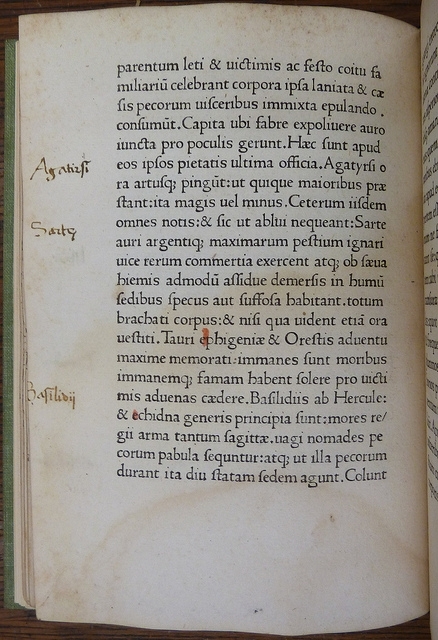 Not all the same names are chosen, but the method of annotation has survived the transition of the main text to print. 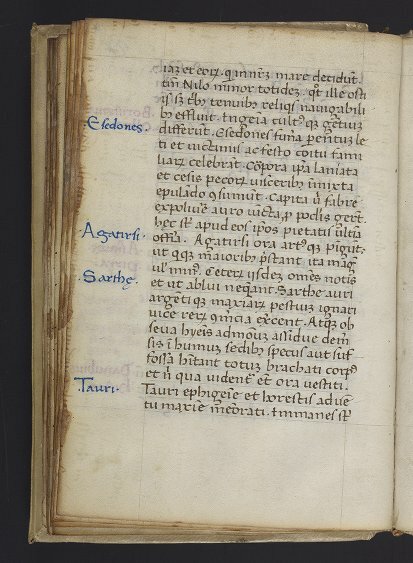 Here are overlapping pages from the pair, both with the names of two Scythian tribes, Agatirsi (the Agathyrsi) and Sarthe/Sarte (the Satarchae), written in the margin. An added benefit of the use of this manuscript for the course was that Paul Needham suggested that the date previously assigned to this manuscript (late 14th/early 15th century) was too early, and that it was probably copied not so long before the ownership inscription at the end of the manuscript, dated 1450. The closest comparisons in the Manoscritti datati d’Italia were indeed from the 1440s, so the date in the catalog record is now between 1440 and 1450. Categories: Manuscript Research, Uncategorized | Tags: LJS60 | Permalink.